Many of my friends play Facebook games like FarmVille and Mafia Wars. Although my Facebook news feed is littered with requests, I don’t have any interest in watering their crops or feeding their puppies. All that noise makes it difficult to get to the heart of Facebook productivity, making jokes and sending pokes. Don’t get me wrong, Facebook is a lot of fun and a great way to stay in the loop, but I wish there were fewer FarmVille updates. Thankfully, Facebook has made it very easy to hide these updates. If you put your mouse over an update, a “hide” button will appear in the top right corner (figure 1). Click the hide button and you’ll have the option to hide all updates from that person or hide the updates from that application (figure 2). Click “Hide FarmVille” and you’ll never see another FarmVille update. The same technique works for other applications (“apps”) such as Mafia Wars, Cafe World and others. On that note, if you’re not already a fan, join Broken Secrets on Facebook — I won’t spam your feed, I promise. Rent, borrow or commandeer an unfamiliar car and you’ll need to gas it up eventually. You know your own car like the back of your TV remote, but you’ve got nothing on this car. The gauge is near empty when you realize you have no idea which side the gas cap is on. You’ve got a 50/50 chance, so you wing it. Unfortunately, there’s nothing that says, “this ain’t my car” better than stopping on the wrong side of the pump. That’s why they invented the gas arrow. 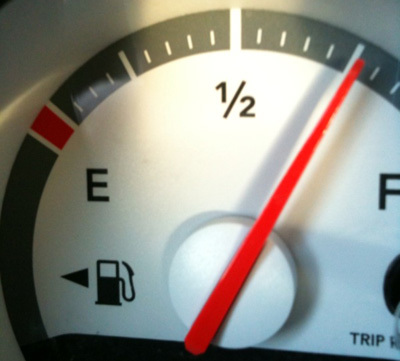 Look for the arrow on the gas gauge, it points to the side of the car where the gas hole is. Of course, not all cars have this arrow. Some people will also say that the pump icon indicates the side of the gas cap with the pump handle, but that’s not universally true. My Dad shared this secret with me a few years ago. I shared it with a few friends, some of them shared with a few friends and if all goes well, everybody will know about the gas arrow and other little known facts. That’s what this site is all about. This is an awesome week and I mean that figuratively. The Book of Awesome arrives in stores this Wednesday and I wanted to celebrate by sharing some broken secrets from the website 1000AwesomeThings.com. One of my favorite “Awesome Things” is “Learning a new keyboard shortcut.” Since I’m talking favorites, I want to share one of my favorite keyboard shortcuts: the space bar. If you’re reading this in a web browser or you do a lot of reading on the web, this is one shortcut you should learn before all others. To scroll your browser down exactly one page, press the space bar. To scroll up one page, hold shift while you press the space bar. It’s that simple, happy reading. Walking, flying, train and bus riding — these are some of the most inane, meaningless and repetitive activities that you may do. Many people do them everyday, even twice or more. Headphones, and the devices they’re connected to, make these activities more enjoyable, memorable and sometimes even meaningful. Most high end sports cars and almost all race cars use synthetic lubricants in their engines. Between the really high temperatures, extreme pressure and intense friction, plain old oil just doesn’t cut it. Lap after lap, hour after hour, there’s a lot of wear from all that horsepower. Although I was surprised to learn about this secret weapon of professional performers, it only makes sense that high performance voices get their own brand of lubricant for their motors too. If you’re going to take your vocal chords for a lap, you might want to grease the wheels with vocalist throat spray.